As a result of many years experience, we are able to deliver a unique level of marketing and management of rental properties, to include full property management, referencing, rent collection and rent guarantee. We currently manage over 800 properties and let over 1300 properties in 2014. Renting is a commercial risk for any landlord, whether you be a multi or single property owner, but renting through Pattinson we do all we can to help minimise that risk to you. 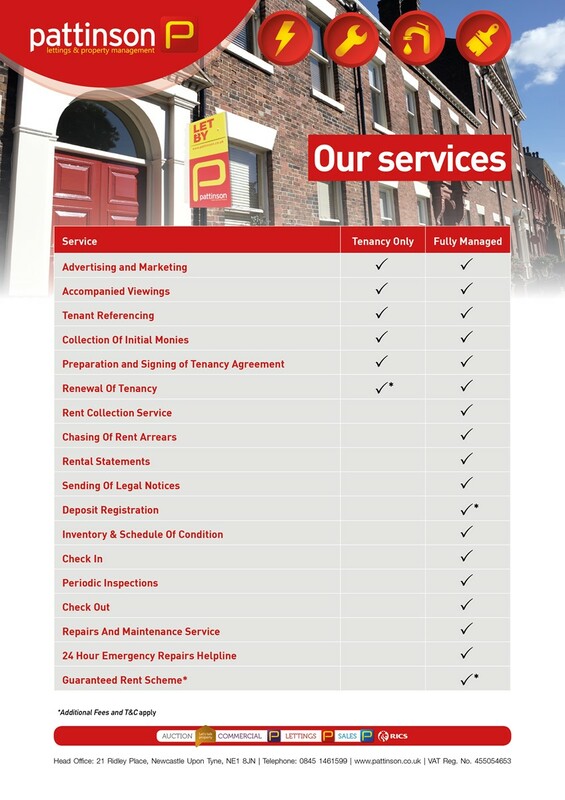 Fully Managed – this is our superior service level, with an end to end, headache free, lettings service to you. This includes marketing and advertising, accompanied viewings, extensive referencing, inventory preparation, tenant check in/out, quarterly inspections, Tenancy Deposit Scheme registration, rent collection, plus a designated Property Coordinator for any queries you may have. We have a full Property Management team, as well as an inhouse Maintenance Team for any additional requirements you may have, or advice you may need. Tenancy Only – finding the tenant, accompanied viewings, all referencing, preparation and signing of lease and collection of initial monies. Rent Guarantee – an optional service for Fully Managed properties and subject to referencing. The full details of all service levels are in our Contract which you will receive at Valuation of your property.